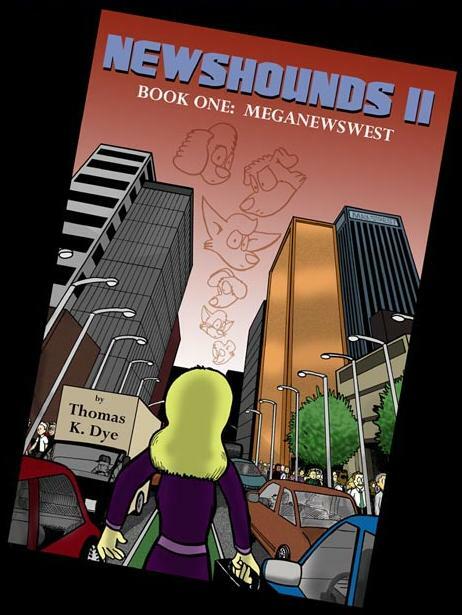 The front cover of 'Newshounds II - Book One: MegaNewsWest', as taken from this strip. Two furry webcomics have recently published new "Dead tree" compilations of their strips. Thomas K. Dye has published the first book of strips from Newshounds II entitled "MegaNewsWest" and contains strips dating since when the original series ended with the staff of KPET News having moved to a now larger news company. The book is published by Lulu and costs £10.64, or you can download the book for £5.70. The other book is the second part of Bill Holbrook's Kevin & Kell treasury, featuring several of his older strips. Following on from his first part of the treasury, "Historic Kevin and Kell", the new book, "The Great Bird Conspiracy" includes strips from previous editions as well as containing a series of never-before-seen extras. Amongst the extras include a teleplay for a proposed 1997 Kevin & Kell television show. The book is published by Moonbase Press and is available from The Bill Holbrook Store at a price of $24.95 (about £16.50). Holbrook is also preparing to publish his 14th annual collection of strips for July, entitled "Rules of Engagement".